There are a lot of ways to project how high the price of an asset might climb. One of the more promising methods for silver is to look at the gold/silver ratio during its biggest bull run ever. Gold and silver both peaked on January 21, 1980. The run-up had been tremendous for both metals. As most of you know, silver outperformed gold. As we showed last week, gold rose an incredible 2,328% by the end of the 1970s bubble. But silver climbed a history-making 3,105%, one of the biggest price advances of any asset in history. Some claim silver’s gain was an anomaly, largely the result of the Hunt Brothers’ attempt to corner the market. Undoubtedly they had an influence—but consider that both gold and silver peaked on the very same day, and the Hunts weren’t buying gold. Pull up charts of both metals and you’ll see they followed the same pattern through most of the ‘70s, implying the same forces were impacting both. And who’s to say there won’t be parties trying to “corner” the silver market again? Silver’s outperformance has continued four decades later… gold is up 24% year-to-date, but silver has risen 36%. Heck, you can even glance at daily prices and see more often than not that silver is up or down more than gold. The reason silver is more volatile is because it is a teeny tiny market. It takes a lot less interest from investors to influence the price, either direction. This is one major reason why Mike and I expect it will again outperform its yellow cousin during this next major price explosion. 1. While the gold/silver ratio fluctuated, silver did not dramatically outperform gold until the mania hit. This tells us we might not see silver’s biggest run-up until the mania sets in. If so, silver is undervalued compared to gold right now. 2. 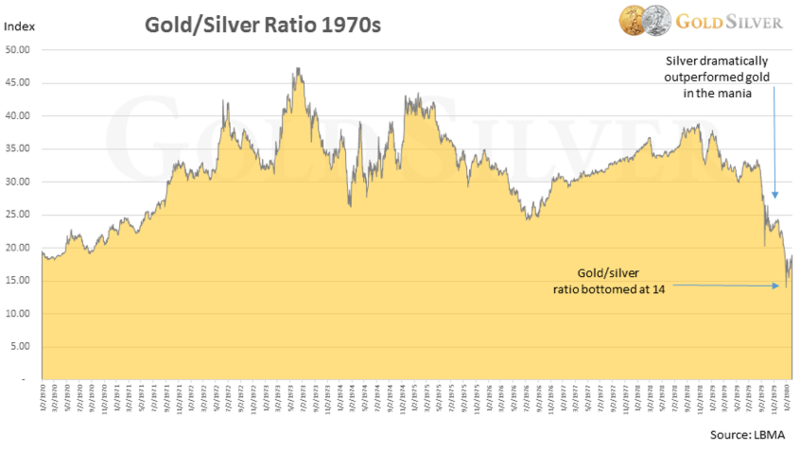 The gold/silver ratio bottomed at 14 on January 2, 1980. It was 17 when the price of both gold and silver peaked on January 21. This gives us a hint about when to sell, which some of you have asked about: start watching the market when the gold/silver ratio drops below 20. Considering the ratio today is near 70, silver could climb a much greater percentage than gold by the time we exit this market. If silver were to match the 1980 ratio of 14, it will exceed three figures at just $1,500 gold. But my research suggests gold could climb a lot higher than $1,500… if it trades at $3,000 and the gold/silver ratio hits 14 again, silver could fetch $214.29 per ounce. If gold climbs to $5,000, silver would reach over $357. You can see plenty of other scenarios where silver enters triple digits at lower ratios. The point is that if we’re right about where gold and silver are headed over the next few years, silver is likely to return a much greater percentage than gold. This is valuable investor information, because it means silver is currently undervalued compared to gold. Our silver Ajax rounds are about to go away for good. We always said we’d limit their mintage, and that day has come. We have a limited amount remaining. They’re on sale: only $1.99 over spot for any quantity. If you want to add ounces—and how many ounces you have is more important in my opinion than fretting about the price dropping a few cents—this is a relatively inexpensive way to add them. And shipping is free for orders of $499 or more. The rarest of our Modern Ancients: There were 120,000 of our Lion and Bull rounds minted, 81,000 Nike rounds, but so far only 44,000 of Ajax have been sold. If you check what our Modern Ancients go for on eBay, you’ll see they’re selling at higher premiums than standard bullion coins. We expect the same thing to happen with the Ajax, especially since its mintage is smaller. Mike and I just bought. For those of you that like to know what and when we buy, we both added more Ajax to our stash last week. Partly because they’re going away, partly because the premium is low, and partly because they could fetch more than Eagles and Maple Leafs someday. If you’re interested in buying Ajax before it goes away for good, order online now! We can’t promise it will remain in stock for long. (If you click to order over the weekend and your order is accepted, they’re still available; if not, they’re gone). Or if you prefer, call customer service (US and Canada) at 1-888-319-8166 (international 001-310-566-6655), 9am to 6pm Eastern. I hope you’ll evaluate how many ounces you hold in relation to what is likely ahead. 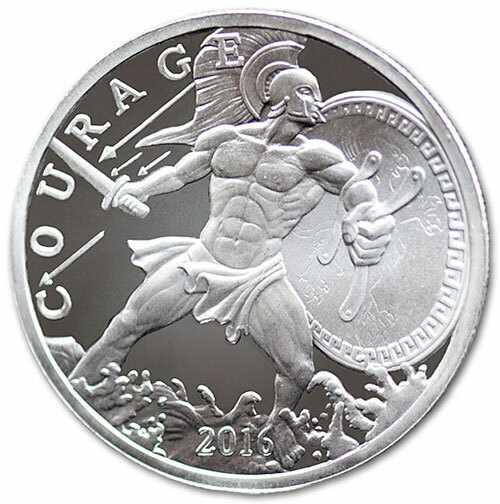 If you need more silver, or want an asset that could appreciate more than standard bullion coins, or need to diversify beyond sovereign coins, our Ajax round is an excellent way to meet those goals.